The U.S. President Donald Trump has frequently made foreign countries central to his political messages, often conveying animosity. But do foreign citizens react more to the speaker of these messages—Trump himself—or their content? More generally, when people are exposed to messages sent from foreign countries, are their attitudes influenced by information heuristics or information content in messages? Although related studies are abundant in the literature of American public opinion, these questions are not fully examined in the literature of foreign public opinion. To address them, we used Japan as a case and fielded a survey experiment exposing citizens to U.S. policy messages that varied by source, policy content, and issue salience. 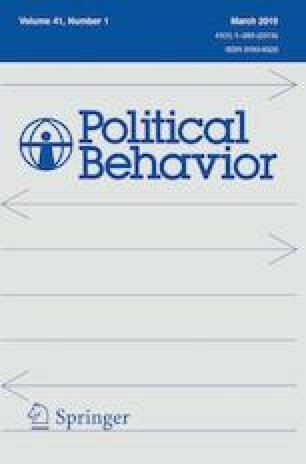 Results suggest that while the source cue (Trump attribution) causes negative perceptions of the U.S., the policy content (cooperative vs. uncooperative) has a larger effect in shaping opinion of the U.S. Furthermore, analysis of interaction effects shows that only when U.S. policy approach is uncooperative does the Trump attribution have significantly negative and large effects. We conclude that foreign citizens rely more on policy content in transnational opinion formation—an aspect that past research in this area has overlooked. Substantively, these findings may demonstrate that even under a presidency that has alienated foreign countries and seemingly undermined U.S. stature in the world, foreign opinion toward the U.S. does not hinge entirely on its political leader. In short, Trump has not irreparably damaged the U.S. image abroad. — U.S. President Donald Trump, on August 11, 2017. Earlier versions of this paper were presented at the 2017 Political Psychology APSA Pre-Conference (at the University of California, Berkeley) on August 30, 2017, in a seminar for Harvard University’s Contemporary Japanese Politics Study Group on November 11, 2017, and in a seminar for Dartmouth College’s Program in Quantitative Social Science on April 20, 2018. The first draft was written by Agadjanian as an independent research paper supervised by Horiuchi. Agadjanian thanks the Dartmouth Center for the Advancement of Learning and the Department of Government at Dartmouth College for providing financial support for the project and conference attendance. We also thank Katie Clayton, David Cottrell, D.J. Flynn, Ben Goldsmith, Josh Kertzer, Dean Lacy, Jack Landry, Brendan Nyhan, Jen Wu, and QSS seminar classmates for useful comments. The online version of this article ( https://doi.org/10.1007/s11109-018-9511-3) contains supplementary material, which is available to authorized users.